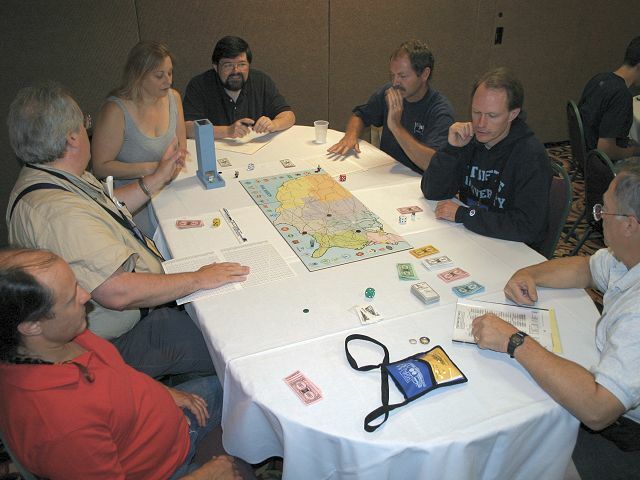 Another first-time RBN champion was crowned at the 2006 World Boardgaming Championships. 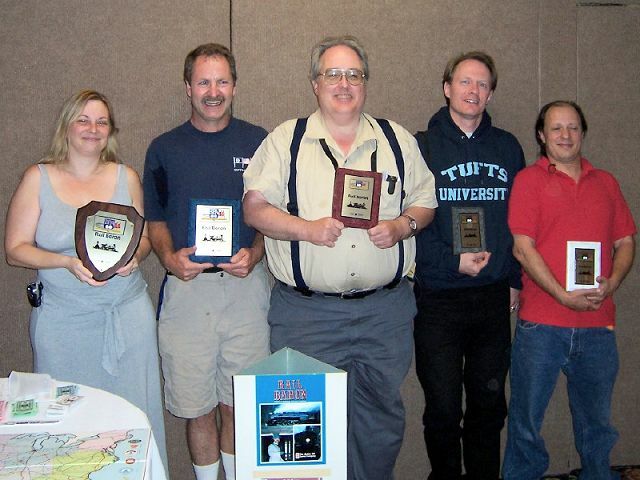 The finalists from a field of 49 are pictured above; from left to right: Inger Henning (champion), Mark Kennel, TJ Halberstadt, Harald Henning, and Dave Steiner. Once again, a terrific bunch of railroad enthusiasts took to the rails. What fun! Congratulations to this year's Final champion, Inger Henning, who entered the Semi-Final as an alternate. Her win there got her into the Final, where one of her opponents was her husband, Harald. Regarding Inger's prize: The player who accidentally had taken it realized it upon arriving home, and it was forwarded to Inger. The prize was a package of RB Player and EB player computer versions donated by Intersystem Concepts. Thanks to Assistant GM's Paul Van Bloem and Chester Lanham, and Chester's wife and my wife for helping out. Paul once again did an outstanding job recording the Final and writing it up. An account and analysis of the Final will be available at the Rail Baron Fanatics website. A condensed version will be provided here. But first, some stats: Thirty-three players started with the first heat, and a total of another 13 players joined during the 2nd and 3rd First-Round-Heats (FRH). Eleven players played in all three FRH, but only one, Paul Van Bloem, won all three games. Way to go, Paul! Three other players won two of their FRH: Chuck Foster, yours truly, and my wife Eve. Speaking of the latter, in the two games Eve won, one was a 5-person game, and the other was a 4-person game that had, as opponents, last year's Champion, Bill Duke, this year's eventual champion, Inger, and this year's Final First Alternate, Donna Balkan. What a win! In the one FRH Eve lost, it was to Donna. Chester Lanham also won a 5-person FRH, and in one of the FRH that Paul won, the opponents included Inger and TJ (Jeff) Halberstadt, who finished 3rd in the Final. In turn order, the players were TJ (Jeff) Halberstadt, Inger Henning, Mark Kennel, Harald Henning, and Dave Steiner. Also in turn order, Home cities and first destinations were: New York/Seattle, Columbus/Phoenix, New Orleans/Indianapolis, Chicago/Atlanta, Kansas City/Chicago. No one switched Home and first destinations. Dave finished his first trip in one round, and bought an Express. Mark arrived in the second round, and also bought an express. This left the first actual RR purchase to Harald, who arrived in the second round and bought the SAL. Harald also bought the second RR on his next trip, which only took him one turn, and he bought the NYNH. The fourth and fifth rounds: Inger bought the PA, and Jeff the NYC. Dave bought the B&O. Mark arrived in Seattle at the end of his second trip in round six, and bought a Superchief. That left the C&O for Harald to buy when he reached Reno in round seven. Inger bought the ATSF in round 13; Jeff bought a Superchief in round 13, and the SP in round 22. In the meantime, Harald bought the UP in round 17. Mark was making shorter trips and buying smaller railroads: T&P in round 12, then ACL, RF&P, CMStP&P, and lastly, in round 21, the L&N. Dave managed to only buy the MP and the SOU. Also in round 21, Harald bought the GM&O to connect his UP and SAL, even though this left him short of cash to pay for leaving hostile Billings. In round 22, he rolled (still-friendly) Norfolk, and auctioned off NYNH. This railroad was valuable to both Jeff and Inger, but Jeff had just bought the SP. The railroad went to Inger for $10. Mark next bought the IC, and then the N&W. In round 26, Harald arrived in hostile Norfolk, but he still had enough cash to buy the CRIP. Then Jeff bought the last railroad, the GN. Jeff: NYC, SP, GN, and WP. Jeff has two excellent railroads, the NYC and the SP, but he doesn’t connect. Inger: PA, CBQ, ATSF, NP, SLSF, B&M, NYNH. Inger is clearly in the lead. Mark: ACL, L&N, RF&P, IC, N&W, T&P, CMStP&P. Mark has been struggling, and has neither a Northeast RR nor one of the big three Western railroads. Harald: C&O, SAL, GM&O, CRIP, UP. Harald’s is the second most valuable network. Dave: B&O, SOU, CNW, MP, DRGW (also WP, shortly). Dave has made long trips, and by round 31 had paid other players 9 times!. After the break, Jeff left hostile Denver, and in round 29 had to auction his WP (to Dave for $19k). Inger bought a Superchief in round 31, but had been managing earlier by rolling boxcars (she and Harald never bought Expresses). Harald bought a Superchief in round 29, and Dave in round 44. Inger announced $150k in round 50. From round 27 to round 50, Jeff paid out 15 times (due to unfriendly destinations and the need to bridge the gap in his network). He was paid 6 times in the same time span. Inger and Harald did much better, with 9 in/3 out and 10 in/5 out respectively. Dave and Mark were close to even, with 6 in/8 out and 5 in/5 out respectively. Surprisingly, Mark was the next to announce $150k, in round 52. In round 57, Inger arrived in Baltimore (near her Home city, Columbus), with $190k. Mark also arrived, in Jacksonville, not all that far from his home of New Orleans, with $198.5k. Both players had a bounce, but Inger did better with her next trip, to Omaha, that paid $13k. Mark’s next trip was to unfriendly Kansas City. In round 58, Jeff announced that he was over $150k. Inger arrived without a bounce in Omaha, and was only 10 dots from Columbus on her own tracks (CBQ to PA), with $203k. The other players maneuvered to catch her if she declared and rolled too low. Mark would just barely have $200k with his Kansas City trip, but he’d have to bounce back to his own RRs, and then be very vulnerable to a rover play. But if Inger missed her chance, he was well-positioned for a winning run. In round 59, Inger declared (over $200k), and rolled Fort Worth as her alternate destination. She then rolled a 14, easily reaching her home city. Jeff: (unconnected) 48.77% with WP, 47.38 w/o WP; monopolies were 1.85% with the WP, 0% without (Reno and Sacramento). Auctioning off the WP (in round 29) hurt Jeff by reducing his monopolies (though no one went to either of them) and making Salt Lake City unfriendly (he never went there). Buying the WP helped Dave a lot, increasing his city access by over 6 percentage points, boosting his network by 15%. The auction of the NYNH in round 22 didn't hurt Harald much, since he couldn't get to the NYNH. It cost him future income, but made life easier for everybody else, since they didn't have to decide who to pay when going to Boston or Portland ME any more. Before the auction, Inger went to Boston and Dave went to Portland ME. Afterwards, Inger went to Boston (and also Albany), and Jeff was en route to Boston when the game ended. NYNH benefited Inger quite a bit, because it connected her to her B&M, made the Northeast completely safe for her, and "locked up" Boston and Portland ME. Looking at the network stats, Inger had an amazingly good network for a 5-player game. Since Jeff's network didn't connect, it's not an even comparison to Harald and Dave's networks. It was impressive that Jeff managed to accumulate cash at the end of the game to move into contention. Harald wasn't far behind, but Dave was way back, due to the unfriendly cities he kept rolling and a late purchase of a Superchief. Thanks again to Paul for his excellent report on the Final. Thanks also to all the players who make this a fun event. FOR LANCASTER 2007: The changes for seating for the Semi-Final (last year and this year) and for the Final (this year) will be continued in 2007. 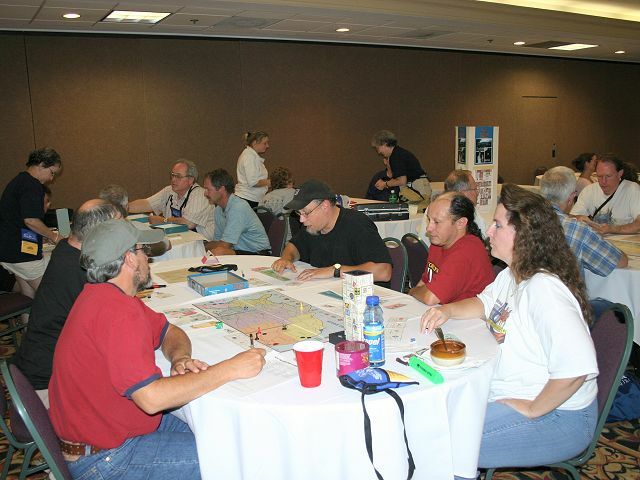 About 50 people are expected to compete in the 16th Annual Rail Baron tournament at the 2006 World Boardgaming Championships (WBC) this coming summer near Baltimore. You don't need to be an expert player; if you simply know how to play, you can join the fun. Riding your own RRs is free. Do not pay the customary $1000 if you ride your own RRs, but not the bank's. Alternates for the semi finals will be the top 2nd place finishers (net worth) in the first round heats. 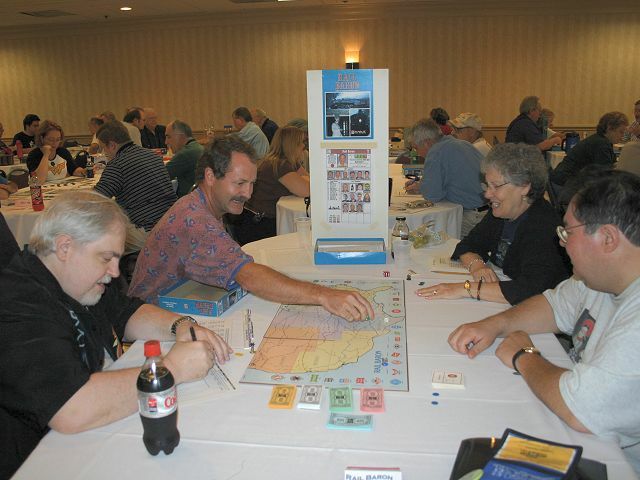 Computers are allowed to assist with the game's table lookups. The tournament is listed as an Advanced event, rather than a Beginner's event. The basic difference is there is no demo and you must simply know how to play Rail Baron to participate. As before, you do NOT need to be an expert Rail Baron player. There are three first-round heats; you can play in as many as you like. If you win you are virtually guaranteed advancement to the next round. Specifically, the top 20 to 30 first-round winners (that's usually everyone who wins in the first round) advance to the semi-finals. The top six semi-finalists advance to the final. The ideal number of players at each table will vary with the round. For the first-round heats, our target is 4 players, for the semis 5, and for the final 6. With this arrangement, to be crowned champion, you will need to win a 4- and a 5-player match, as well as the slugfest 6-player final. The table matchups (player groups) for the semi-final matches will be based on AREA rank prior to the WBC. The highest AREA rated players will be grouped with the lowest. Another way to advance to the semi-finals is by finishing well in the first round heats. Net worth will determine the alternate players who will be eligible to round out the semi-final tables. Please note the GM may be forced to make changes to this plan should the number of participants vary substantially from that anticipated. The BPA is allowing us to use laptop/notebook computers to assist with the game's chart lookups (destination and payoff). Use is optional, and must be agreed to by all players at that table. The computer's screen must be large enough for the text to be visible to all the players. To do the chart lookups for you, you must employ the Boardgame Conductor in the RB Player computer program, version 2.9 (or newer). You may not use any other portion of the program or any other Rail Baron related program during the tournament match. Even an old laptop will do since the RB Player program operates on almost any computer running Windows 3.1 through XP. In advance of the tournament, please download, install and try a shareware copy of the RBP. Use of the program's Boardgame Conductor remains free (even after the shareware's 30-day trial period). Feel free to write to Ron with any questions about the RBN tournament. Ron's email is secundstar@erols.com. #1 - Ride your own RRs for free:. Do NOT pay the customary $1000 if you use your own RRs but not the bank's. Riding the bank's RRs for any portion of a trip costs the usual $1000. Tests indicate this speeds up the game by almost 10%. #2 - Free SuperChief: Once you have an express, you can upgrade to a Superchief for free. Note that you still need to consume a purchase opportunity to perform the upgrade. Jumping directly to a Superchief (without an Express) costs $40,000. This rule will be used for the first round only. For subsequent rounds, the Superchief cost will be reduced per Optional Rule 2 in the RBN rules. #3 - Roll 3 with a SuperChief: If you do not have a Superchief, and are entitled to a bonus die, the bonus die must be rolled after you have completed movement for the normal roll. Once you have a Superchief, you must roll all three dice at once, and then use them all for movement. #4 - "Roll-and-move-immediately" rule not enforced: This courtesy rule stipulates that once you roll the dice, you must start moving your pawn immediately. We will not enforce it. #5 - Home Swapping: Is your first destination a bad one? Before you roll the dice to move for the first time, simply say you are Home Swapping: your first destination becomes your home city and your home city becomes your first destination. Freely teleport your engine to your new home city, and continue play. This rule helps give everyone a fair start. For use fee purposes, assume you are established on whatever RRs serve your new home city. For victory purposes, return to your new home city. Note that this variant makes it possible for two or more players to have the same home city. More details. All these special rules are supported by the RB Player computer shareware. And, yes, the computer version makes a good enough opponent to help prepare you for the tournament, even if you've never played the board game itself. If you arrive at your destination on the normal dice, and the bonus die is pending, you get to roll for your next destination and "get the bonus bounce out" (use the bonus die to begin the next trip). Note that with a Superchief engine, you roll the normal and bonus dice together and therefore, if you "bounce out" you use that die to start your next trip; you do NOT re-roll the bonus die. Per BPA rules, no "cheat sheets" or electronic aids except as described above may be used during tournament play. The replacement destination and payoff chart distributed free by ICI is approved for use. If a match is running longer than the expected duration, the GM will adjudicate it (declare the match ended, and pick a winner) upon request if more than half the remaining players in that match wish so. At his discretion, the GM may also adjudicate a match that is running longer than expected. The GM's decision is final. Due to time conflicts with other games, it is likely one or more semi-final and final slots will be unclaimed. For example, in a prior year, two of the six final slots were unclaimed and were filled by others. Thus, even if you did not win during the prior round, but have a high net worth, you should check in because you might advance. If, after 10 minutes past the scheduled start time of a round, there still remain open table seats, these seats will be offered per BPA guidelines for byes (byes into the semi-final will be in order of most recent champion, byes into the final will be in order of AREA rank).